Toronto and Region Conservation Authority (TRCA) assesses the impact of rain and snow on the hydrology of the region. PRECIPITATION: Liquid (rainfall) and solid (snowfall) precipitation are monitored across the TRCA watersheds on a continuous basis. Precipitation data has a multitude of uses for both the TRCA and our stakeholders and clients. This data allows for the development of design storms, storm event reporting and complex hydrological modelling. CLIMATE: Climate monitoring involves the collection of a number of meteorological parameters including air temperature, wind speed and direction, relative humidity solar radiation, barometric pressure and soil moisture. While this network is relatively young (in place for less than five years), the anticipated use of the data includes land use studies, trend analysis, and evapotranspiration estimates. SNOWPACK ACCUMULATION: The snow course monitoring network aims to document the amount of snow on ground, and is collected twice monthly in the colder months. This data allows TRCA flood staff to determine the potential impacts of snow melt runoff on the TRCA watercourses during the spring melt. With respect to precipitation, trends in annual volumes have not shown significant changes over time within the TRCA watersheds. Changes have mainly been observed in the distribution of the precipitation, with climate change expected to further impact the distribution of rainfall throughout the year. Currently, the majority of rainfall events in the TRCA are small events, totalling less than 5mm in a 24 hour period. These small storms constitute just under 70% of all the rain events we see in a typical year. For flooding potential to exist, rainfall totals typically need to be in excess of 25-30 mm. 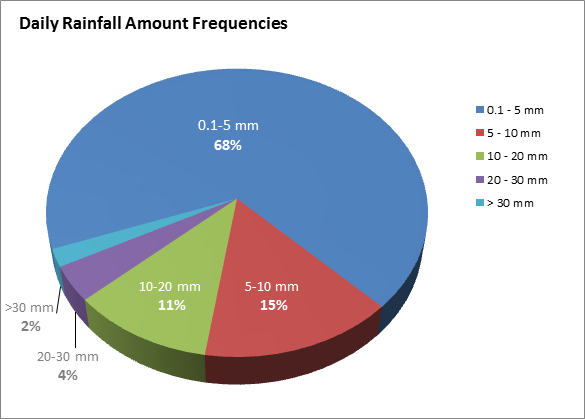 Events totalling more than 30 mm of rainfall make up just 2% of the rain events we see in a typical year.